“Oh yes, I remember that dude,” I responded. Indeed, it had been a rather moving and memorable presentation at the PPL Center the night that Ray Davis from Emmaus was honored for his service to his country during World War II. Not a dry eye to be found anywhere in the entire arena to be certain, as someone in this little gathering on Wednesday evening astutely observed. And so a seat was found for Mr. Davis in short order and, as luck would have it, that happened to be right in front of me. As soon as a break in the action allowed, I could not help but mention to Mr. Davis that I had been present the night he had received his very own Phantoms jersey, and, having been a student of history back in college, that I was fascinated to be in the presence of such a distinguished veteran. An extremely affable and gregarious individual, Mr. Davis was more than happily to share some of his war stories and a fabulous conversation covering a variety of different topics ensued. Meanwhile, the in-form Lehigh Valley Phantoms suddenly struck for a pair of bang-bang goals by Greg Carey and Taylor Leier within less than a minute of each other. This, of course, from the same Hamilton Street Heroes squad that had traditionally come up small when skating on home ice versus the powerful WBS Penguins, as their all-time record of just two wins in twelve meetings at the PPL Center heading into the Wednesday night’s contest clearly reflected. Naturally, such a historically lopsided series only served to make what was transpiring all the more spectacular. Fact is, over the course of the first two periods on Wednesday evening, the Phantoms had actually outshot the Baby Pens by the noticeable margin of 28-18 and enjoyed a good amount of possession as well as their fair share of quality attack zone time in the process. But WBS goaltender Tristan Jarry, who had halted an impressive 36 shots while shutting out Lehigh Valley on his last appearance at the PPL Center the previous spring, had been able to keep the Heroes off the scoresheet for the first 37 minutes and 29 seconds with yet more flawless netminding. Indeed, it was only an excellent piece of hand-eye coordination from Phantoms free agent signing Corban Knight, who was robbed by a great save from Jarry right in front but had the presence of mind to grab the rebound out of the air before stuffing the puck home, that had finally gotten head coach Scott Gordon’s guys back to level terms. While waiting for the third period of play to commence, Kram correctly noted that, for all the official attempts on goal, the Phantoms had not generated all that many quality opportunities. I was of the opinion that Lehigh Valley had mostly been missing that final decisive pass in the offensive third. Without a doubt, what the home side really needed was that little something extra special to push them over the top in this battle against the intra-state nemesis from the north. 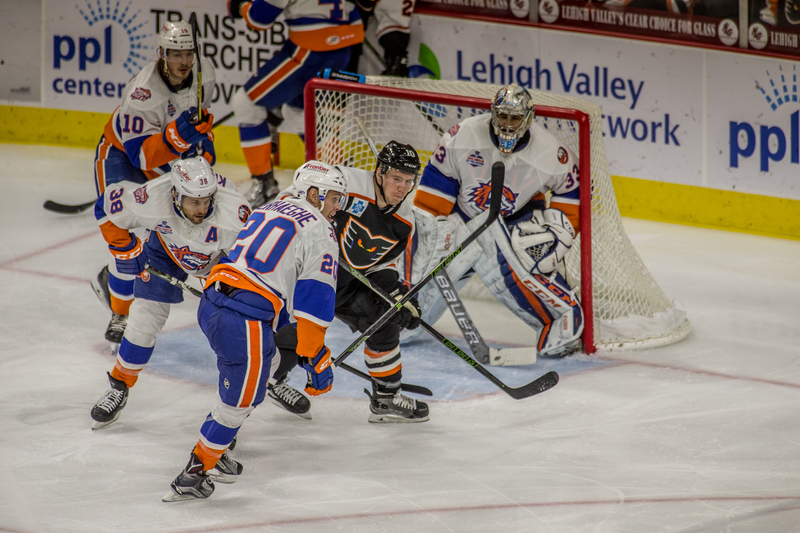 In the jubilation that followed Leier’s critical strike which doubled Lehigh Valley’s lead, I could not help but tell Mr. Davis that I thought it was pretty obvious that it was he who had brought along the goals that the Phantoms had been looking for all night long. After the final horn had sounded, I heard several patrons remark that this particular game marked the greatest triumph that the home team had ever recorded here at the PPL Center, probably because Wilkes-Barre/Scranton are once again this season one of the strongest teams in the entire AHL and almost always win when they come to Allentown. As far as I was concerned, only seemed fitting to assign “credit” for this monumental victory to a decorated war hero from America’s Greatest Generation. It was only on the way home that I was able to comprehend the full irony of the whole situation. The equivalent for “bang-bang goals” in German sports vernacular would be “Blitztore” (lightning goals). Mr. Davis, who landed at Utah Beach on D-Day and would shortly thereafter become in demand because he could understand Pennsylvania Dutch as a result of having grown up in Montgomery County, was an active member of the United States armed forces that defeated the Nazi war machine which had been noted for their so-called “Blitzkrieg” tactics. I leave it to future academicians to figure out the rest. This is my story. And I’ll be sticking with it. very nice. see ya at the next game.